There is only one subject in the documentary Collapse: Michael Ruppert (more on him later). There is only one setting. There are snips of archival footage, but for most of 80 minutes, it’s a screen filled with one man talking. By all rights, Collapse should be no more than a niche film with limited appeal. But Ruppert has a lot to say about situations that will affect all of us. And more importantly he’s photographed by a devoted disciple who (literally) presents Ruppert in the best possible light. As talking-head documentaries go, Collapse is surprisingly well produced. High key lighting and fluid tracking shots give it a sense of ominous weight. 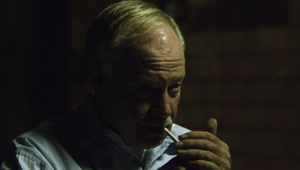 Credit director Chris Smith ( American Movie, The Yes Men) and cinematographer Max Malkin with making the middle-aged, balding, chain-smoking Ruppert look like film-noir hero. The combination of doomsday message and devoted biographer makes Collapse a chilling documentary. Michael Ruppert has written many books, including one called Confronting Collapse: The Crisis of Energy and Money in a Post Peak Oil World, which is the rough basis for this documentary. At the risk of putting words into Ruppert’s mouth, I’ll summarize his take on Peak Oil. (That’s the peak on the graph of oil production against time... that first day when there will be less oil produced tomorrow than there was yesterday.) Oil, he says, has allowed humanity to live with the notion of infinite growth. Cheap and abundant oil allowed farming to become more efficient. Oil facilitated tractors to plant more crops, ammonia to condition the soil, petroleum-based pesticides, more tractors to harvest the crops, and trucks to ship the food to your neighborhood Safeway. We have plenty and it’s all thanks to oil. But when the day comes that it takes more energy to retrieve and refine oil than we get out of the recovered resources, there will be a collapse. No more shipping, no more tractors, no more pesticides. He says that the collapse of oil will reverberate through the economy and other human endeavors. When prices start to climb higher, we’ll see the beginning of the collapse. Climate refugees will flood better-off nations, which will have to stretch resources and budgets thinner, which will increase demand and drive prices of everything even higher. Even clean water will be scarcer.... It’s a hellish spiral that might give you nightmares. The ultimate price is human lives. Before we figured out how to use oil, the planet never supported more than, say, a billion people. In the future, without oil, Ruppert says Earth will have to kill us off back down to a that pre-industrial level. This type of documentary is obliged to end with a hopeful, empowering message, though this one isn’t as hopeful as some. Ruppert recommends buying gold, using composting toilets, growing your own food, generating electricity as locally as possible through solar and wind, and joining a community you can lean on (he doesn’t recommend becoming the loner with the shotgun). Collapse is one movie that suffers from its DVD extra features. The deleted scenes are in various states of completion. The ones that are not yet color timed and converted to film frame rates look like, well, video. That harms the ominous, severe image of Ruppert that the finished movie presented. And in some of the deleted scenes, you can start to see that Ruppert has a habit of talking in analogies, which makes his use of analogies in the finished documentary seem less illustrative and more like his way of oversimplifying very complex ideas. Essentially, the extra footage makes him seem less like an authority than the movie did. There are also video interviews with Ruppert a year after the movie was completed. Ruppert seems happier, healthier, and maybe a little heavier. You do end up rooting for Ruppert in Collapse and it’s good to see that his message is getting around thanks to the documentary, and that it has maybe had a positive impact on Ruppert. But these followup interviews also hurt the authority of the “character” in the documentary who is angry, serious, and on the verge of leaving us to our fate in disgust. The man interviewed in the supplement seems more like the smart friend who occasionally lets slip his wacky conspiracy theories during an otherwise polite dinner-table conversation. A little post-movie Wikipedia reading brings Chris Smith’s favorable view of Ruppert back into balance. Therefore, I’d recommend watching Collapse cold. Don’t do any research beforehand. Afterwards, if your interest is piqued, do your homework and see if your impression of the messenger — or the message — changes.